Well, as it's so funny, I think you'd better be selected to play for the boys' team in the rugby match against the masters this afternoon! New to the 2015 RWC - Ninth playing tenth in the bowl final. Never, ever, stand between Boris and a tub of fried chicken ! 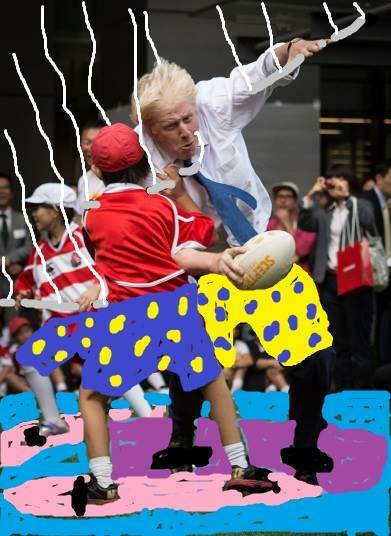 Boris liked this 'Mental Age' Rugby. Boris Johnson, looking more dangerous than England's entire World Cup campaign. Looks like even Boris is now officially on the Hayne Plane. As the mayor made his way to the office past the school zone he was keen to show that he too was subject to the London congestion charge. "I see congestion, I charge my way through" said Boris. After the game Boris apologised. "But they introduced the flanker as young Kenny. And when I saw the colour of his shirt something just snapped inside me" said Boris. Boris tried the old left-right-left dummy. But he could only manage right, right, right. why NOT promote windsurf humour MORE ?? "Sorry Old chap,", A determined Boris said to the young hombre, "I must go. There is a microphone over there !" Look quick, over there kid. There's a real rugby player, Stephen Moore. Sorry Uncle Tony, what was that. Shirt front a Boris! Boris drops the shoulder into Canadian Joe Whingesurf as a subtle reminder that he doesn't have to come here to play if it hurts his feelings. Thanks Waterloo. Will get onto it although a bit doey this morning after watching Wallabies.